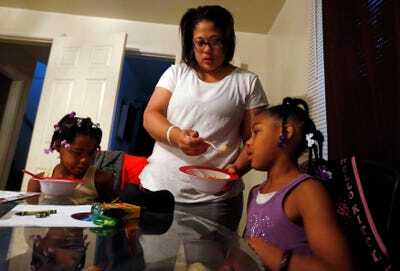 Delores Leonard is raising two daughters on less than $US600 in monthly income. 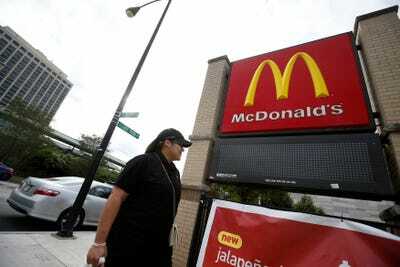 The 28-year-old mother has been working at a McDonald’s restaurant in Chicago for seven years. 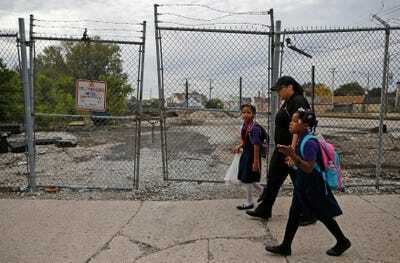 But she has never made more than $US8.25 an hour, which is the minimum wage in Chicago. She’s one of thousands of fast food employees who have taken part in a recent wave of protests for better pay and working conditions. 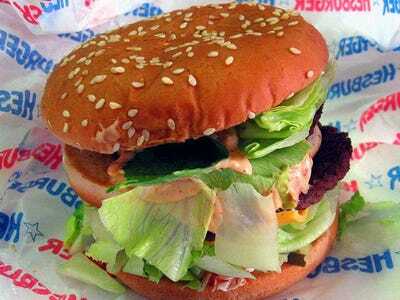 Most fast food workers make less than $US8 an hour, according to the Service Employees International Union. 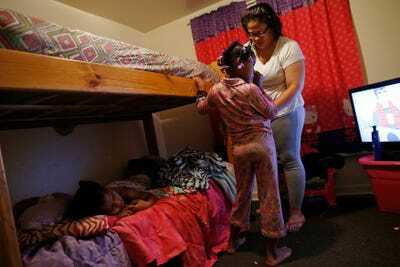 Reuters photographer Jim Young spent a day with Leonard to see how she lives on minumum wage. Delores Leonard's day begins before dawn. 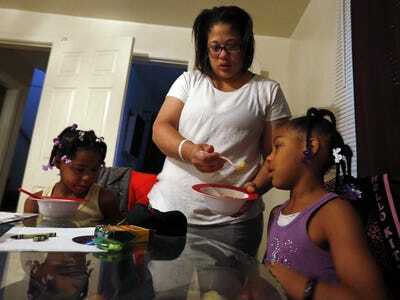 She feeds breakfast to her daughters, Erin and Emmarie, and gets them ready for school. 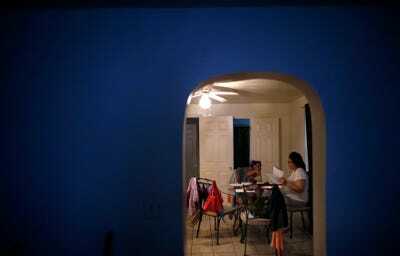 The 28-year-old single mother looks exhausted as she helps her daughter Erin, 6, with her homework at the breakfast table. The family of three shares this small apartment in Chicago. 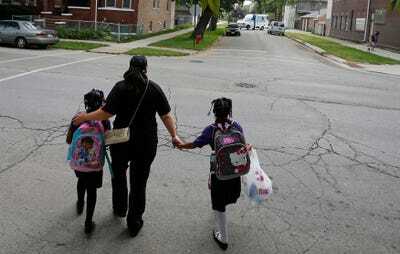 After breakfast, Leonard dresses for work and walks her daughters to school. During their walk, she shows Erin how to make a heart symbol with her hands. Leonard makes about $600 a month, or $7,200 annually. The federal poverty guideline is $19,790 for a family of three. 'I work so hard and it's still like I'm struggling,' she told Bloomberg in an interview in September. She kisses her daughter goodbye as she drops her off at school. 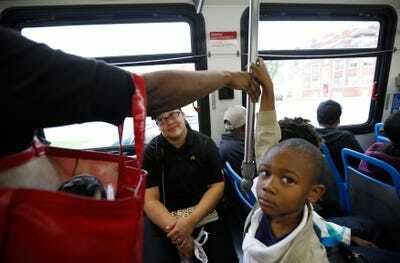 Then she boards the first of two buses that take her to work. Her commute lasts about an hour. 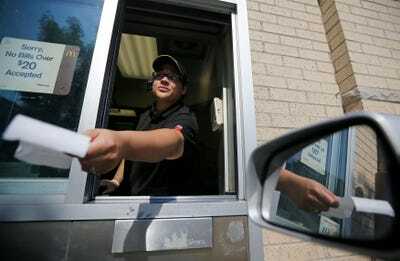 She has worked at a McDonald's in Chicago's Hyde Park neighbourhood for the last seven years. But she has never gotten a raise. Leonard rotates between working the cash register and the drive-through window. After her shift, she waits for a bus to take her home. 'I work so hard and it's still like I'm struggling,' she told Bloomberg in an interview in September. She stops by the grocery store and gets some help from food stamps at the checkout. She limits her purchases to what she can carry, since she doesn't have a car. Then she boards another bus home. 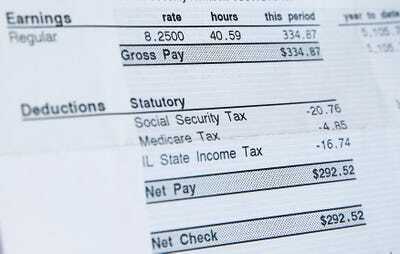 Here's a look at Leonard's paycheck, which comes to a total of $292.52 for two weeks of work. 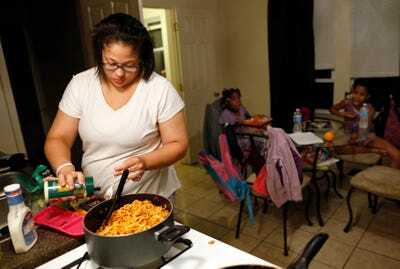 After her daughters return from school, Leonard cooks a meal of pasta and salad. 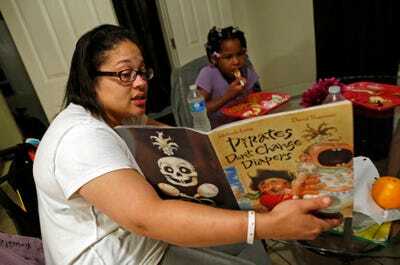 While her daughters eat, she reads them a story at the dinner table. Then she gets them ready for bed, before their routine begins again the next day.